When two teams are named Mustangs, it was only befitting that the action resembled the famous shootout at OK Corral with ten different lead changes occurring during the night. In the closing seconds of the game, Indiana trailed 38 – 34 when Indiana’s quarterback Eric Hooks (North Central HS; U. of St. Francis) found Jerimy Finch (Warren Central HS; Marian U.) for a ten-yard touchdown reception and the lead 41 – 38. However, Chicago was not about to quit as they took the ensuring kickoff down to Indiana’s seven-yard line following back to back penalties on Indiana’s kickoff team. With just eight seconds remaining, Finch once again came up with the big play as he intercepted Chicago’s quarterback David Skowronski in the end zone to seal Indiana’s home opener at Arsenal Tech High School. Chicago opened the game with two quick scores and enjoyed a 13 – 0 lead at the end of the first quarter before Hooks found his favorite target from last year Gavin Wisel (Trine U.) for a 6-yard touchdown reception. Running back Erick Harper (Arlington HS) punched in the two-point conversion. On the next possession, Hooks found 6’4” receiver Kyle Wimberly (Warren Central HS) for a 61-yard touchdown reception. Hooks also hit Paul Carter (Northwest HS; U. of St. Francis) for a touchdown to end the night with four touchdowns and 325 yards passing on 24 – 48. One of the highlights was speedster James Sharp (Arlington HS) who took the handoff from Hooks for a 65-yard scamper down the sidelines and Dontae Hart (Ben Davis HS) also added a two-yard plunge to close out the scoring. Defensively, the Mustangs were led by former Marian U. All Conference linebacker, Dontae Crooks (Arsenal Tech HS) and Eric McKinney (Washington HS) who both finished the night with five tackles. Crooks also added a sack and pass deflection. Linebacker Demetrius Hall also had an interception for Indiana. 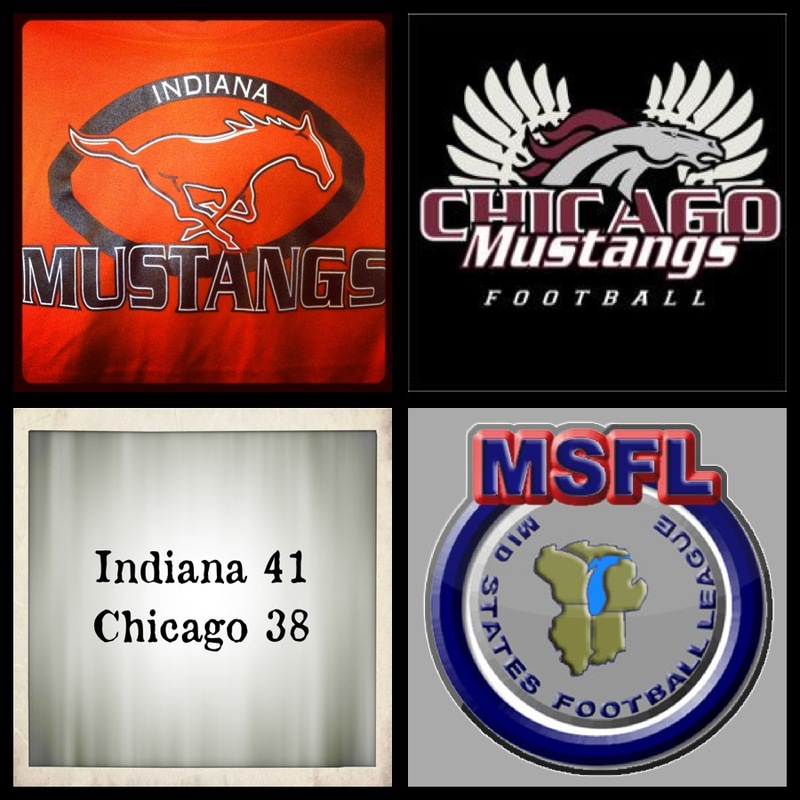 The Mustangs are headed to Chicago this Saturday to face four-time MSFL champions, Chicago Thunder. The Thunder defeated the Mustangs in overtime last year during the MSFL playoffs, so the Mustangs are looking to avenge this loss. The Mustangs are still looking for quality offensive linemen, dedicated volunteers and business sponsors. Advertising opportunities are available ranging from $50 – $2,500. For more information, please contact James Stamper (765-681-1327) or Rich Castanias (317-379-4669).